Booktober is in full swing! We have gotten a chance to showcase a couple of spooky reads but I wanted this new book series to take it a step further. I wanted to step into the minds of some of our writer’s this month and get to know their stories on a more personal level. One of the stories that I got to review was The Peculiar Haunting of Thelma Bee by Erin Petti. It is such a quirky read that’s filled with magic, thrills and the strength of friendship. If you haven’t read my book review on this fun read yet then you can check it out here. But for those who have read it, we got to chat with Erin Petti and take a more in-depth look into Thelma Bee’s peculiar world. TYF: When did you know you wanted to become a writer? 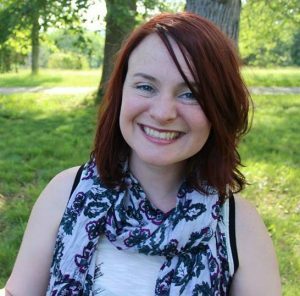 Erin Petti: My 3rd grade teacher gave me my first creative writing assignment and I can clearly remember the first time I experienced the immersive, awesome feeling that it gives you. I think that was the first moment I knew I wanted to write. TYF: How did the story of The Peculiar Haunting of Thelma Bee come about? Petti: Somewhere I heard the advice, “write the book you want to read” – that was the start of it. Thelma Bee is a spooky New England mystery with ghosts, quirky friends and a mysterious family tree which is pretty much all my favorite stuff. It was a really joyful experience to write this book because I allowed myself to really dig deep into the characters I love and topics I love to research. TYF: Speaking of characterization, these characters are very vivid and descriptive. It was, honestly, one of my favorite things about your book. Which character did you come up with first and which character was your favorite to write about? Petti: Thelma was first! With her, I created a kind of sixth-grade counterpoint to who I was when I was 11. I was a very anxious kid who thought too much about other people’s opinions. Thelma not only marches to the beat of her own drum, she leads the parade and doesn’t care who follows. I love her a lot for that. I think that Izzy and Alexander tie for second place, though – and I can’t decide who is my favorite. Writing this book was like getting to know great friends. They’re so unique and strong in their own individual ways. TYF: Since the story revolves around the paranormal universe, did you do any research or have been a fan of ghost stories prior to writing The Peculiar Haunting of Thelma Bee? Petti: I’ve been bugging family, roommates and now my husband for years with my obsessive viewership of any available paranormal reality TV show. I’ve never been on a real ghost hunt, but recently got to meet some genuine paranormal investigators and check out their equipment – it was awesome! I have always loved scary stories even though I’ve always been kind of a wimp about them- so it’s a fun intersection! TYF: Thelma Bee, despite being so young, is quite the foodie and I especially adored her love for pizza. Are you a foodie as well? If so, what are some of your favorite foods to eat? Petti: Well, at the moment you are talking to a woman who is four months pregnant so the list goes: Mac n’ cheese, chicken wings, any kind of cake, more cake and avocados. I think my palette might be more refined when I’m not gearing up to have a kid. Pre-baby, my very favorite food in the whole world was sushi, so I’m pretty excited for that to be a part of my life again! TYF: What’s your favorite thing about writing fiction for middle schoolers? Petti: I love writing for this age because I think it’s the land of ultimate possibility. Middle-grade readers are smart, savvy and strong. They are learning about the real world in a fast and furious manner. And it’s not all great and happy stuff either. Meanwhile, all of the magic and pure creativity of childhood still keeps some of its shine. I think Middle Grade has the opportunity to explore very adult things while holding on to the sense of wonder and possibility that adults sometimes lose when they get older. TYF: When it comes to your writing process, do you envision and focus on your characters first then plot, vice versa or is it a mix of both? Petti: It’s a mix and I think that one lends itself to the other. I need to but as I go and learn more about my characters sometimes it becomes clear that X character would not make Y decision – so we shift courses. Staying true to a character’s drive and wants is probably the best way to create a dynamic plot. TYF: What are some of your favorite books to read that gets you in the Halloween spirit? Petti: I love this question! Jonathan Stroud’s Lockwood and Co. books are my current favorite. I just finished the most recent one and I can not wait for the next installment! Paul Durham’s The Luck Uglies series is brilliant and vivid and I can not recommend it highly enough. Gaiman’s Coraline is gorgeous. I think that most of the books I read, even in July, could be categorized as “Halloweeny” in some way! TYF: Thelma Bee loves Eugene’s spicy hot chocolate and since it’s the fall season and pumpkin spice lattes are all the rage right now, what’s your favorite fall drink? Petti: Good grief, I love a good latte or English breakfast tea with milk and sugar with a couple of cookies, of course! 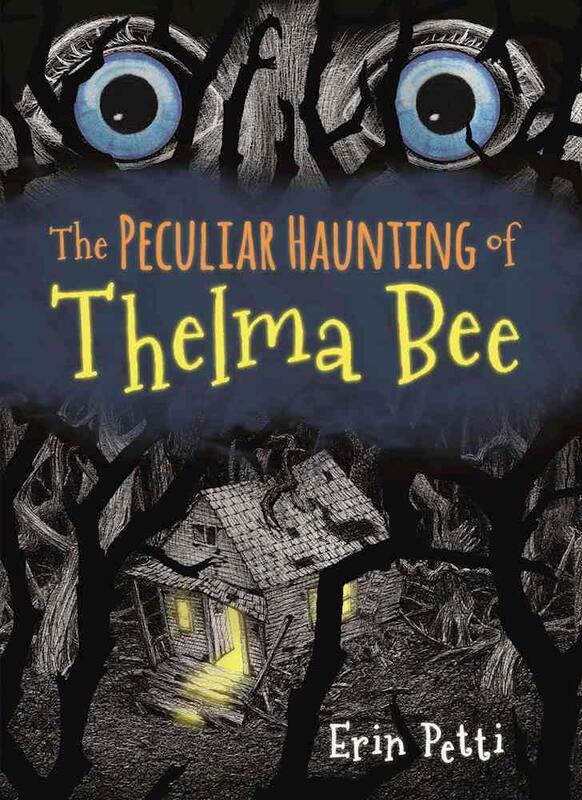 TYF: For our young readers, what message do you want them to take away after reading The Peculiar Haunting of Thelma Bee? Petti: The major message is that you have power. Young people might not always be put in a position where they feel that way, but you are strong and can make a change. I also love how little the kids in my book care about what other people think. I want that for my own daughter and for every other young person in the world. The more you stay true to yourself, the cooler you’ll be. Even if your cool is a little weird. It’s best to embrace your cool-weird and shine. Others will catch on eventually. TYF: Lastly, what advice do you have for our young readers who aspire to be writers as well? Petti: Read, then write! I didn’t know how to write a novel when I started drafting Thelma. At no point did I get a badge that said that I was allowed to write a novel. You can learn by reading things you love, and then by doing and making a million mistakes and getting back on track. If you want to write a book – write! Previous ArticleDC's Legends of Tomorrow 2x01 "Out of Time"